Social Resilience: The timely capacity of individuals and groups–family, community, country, and enterprise–to be more generative during times of stability and to adapt, reorganize, and grow in response to disruption. In today’s complex world, escalating rates of burn-out, secondary traumatization, moral distress, and needless tragedy often characterize organizations whose human capital tools fail to keep pace with relentless change. Emerging demands require new approaches. 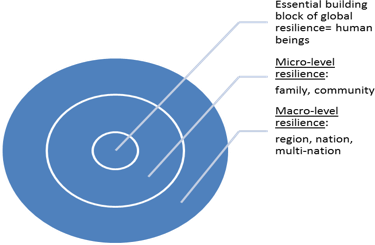 To this end, TGW’s Social Resilience Model (SRM) targets collective capacity building to amplify resilience within and across social systems. Developing collaborative networks, in which biological self-regulation becomes a core competency, SRM’s broad cross-sector focus builds strategic nodes of SRM trainers who foster, sustain and scale future resilience-building capacity. SRM provides a systematic framework of theory and practice, featuring a skills-based, practical approach grounded in key neurophysiological dimensions of human resilience such as safety, attention, attachment, and integrative functioning. Incorporating SRM skills and training within systems addresses both the transactional and transformational aspects of adaptive change aimed at system-wide resilience. Designed to achieve sustainable and scalable outcomes, the model incorporates peer collaboration and cross-group support networks. Implementation lessons, data analysis and outcomes evaluation are conducted at relevant milestones throughout all SRM projects. In summary, SRM is a collective, skills-based approach to improving individual and group well-being and resilience. It harnesses the tension between current realities and emerging futures by teaching neuroscience-based skills to heighten attention, shift patterns of dysregulation, and promote capacity for individual stability and generativity. Used within and across entities, collaborative intelligence enhances and reinforces individual and organizational well-being.